Over the weekend we drove the 150 miles to Page, Arizona. we had to get some work done on our truck, and we wanted to be there when the Ford dealership opened, so we went on Sunday afternoon and spent the night at Motel 6. On Monday morning we walked across the street to the service department, and made an appointment for 1:00 p.m. That left us with the morning to do some sightseeing. 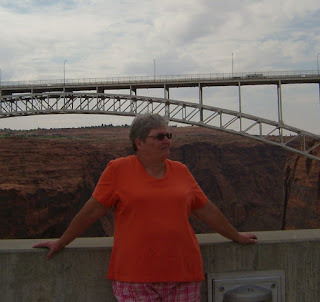 We drove over to Glen Canyon Dam and Lake Powell. What an amazing sight! Even though the lake is 67 feet below full pool, it is still a beautiful oasis in the desert. We took a 45 minuted guided tour of the dam. Construction on the dam began in 1956 when President Eisenhower pushed a button in the Oval Office that triggered the switch by telegraph to ignite the first dynamite blast of the cliffs above the Colorado River. The construction work continued 24 hours a day, 365 days a year, until the dam was completed in 1963. The photo below was taken from the bottom of the dam , looking up at the visitors center at the top of the cliff. On the way home, we took highway 89 north through southern Utah and Grand Staircase-Escalante National Monument. The visitors center there had great displays of dinosaur bones that have been discovered in Utah. I asked FabGrandpa to put his hand on this dinosaur foot to show you just how big it is! I ‘m glad these guys aren’t walking the earth these days. We found a really good restaurant in Page, you can read about our dining experiences at Fiesta Mexicana by clicking here. Although we came to this area because the Grand Canyon is here, there is so much more to see and do here, it is unbelievable. Our family doesn’t get to travel often, but I enjoy seeing the pictures you post here. Sometimes I can even imagine the smells and feel of the weather. Thanks for sharing! Great pics. (Here from Ravelry). Hi Fab Grandma, I just discovered your blog and am really enjoying it.